Contrasting rustic with modern. Imagine a wall of stone capped off with a cascading staircase of wood with totally unobstructed views because of the use of glass stair railings. By blending elements of rusticity with modern elegance, you’ve just created a one-of-a-kind look you won’t see anywhere. Freestanding staircases. These are beginning to be seen in every city in the world. No wonder, because they look magnificent. Usually the stairs are fashioned in light woods, but what sets them apart is the look of total detachment from the rest of the room. Here the staircase stands alone. All because of the glass stair railings. Very impressive. Decks with unobstructed views. Never mind those clunky wooden railings that once ran the length of a deck. Now with frameless glass railings, you can step outdoors and feel as if you’re in the middle of it all. You’re not just on the deck, you’re right where you are looking; the oceanfront, lakeside or woods. Clean, modern and striking. It’s not every material that brings those words to mind. 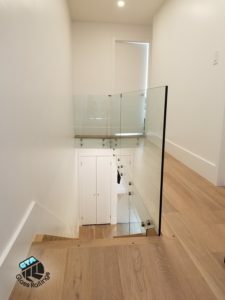 Glass stair railings can give you the best home renovation you’ve ever experienced.